Symmetry Financial Group team members worked together to raise over $28,000 in donations for the 2017 Make-A-Wish Trailblaze Challenge. The Trailblaze Challenge was an incredible experience! It was so much more than a 28.3-mile hike – it was a life-changing journey. 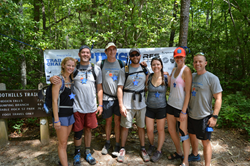 Symmetry Financial Group staff members participated in the Trailblaze Challenge hosted by Make-A-Wish Central and Western North Carolina on May 20th, 2017. The Symmetry Team raised over $28,000 in donations for the nonprofit organization during the one day event. The Symmetry Team raised $28,594 in gifts and donations; each hiker on the team met or exceeded their fundraising goals. The funds raised by Symmetry will be used to make over 300 wishes come true.